1889-10-31- Bolado from Southern Pacific Railroad Company [unknown transaction]. 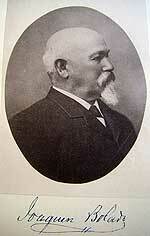 1873-06-28: Avy Grants Strip Across His Parcel of Rancho Santa Ana y Quien Sabe to Southern Pacific Railroad. Saturday, June 28, 1873 – Charles Avy of Monterey in consideration of the benefits to be derived by me in the construction of the SPRR on and across my land known as the Santa Ana y Quien Sabe Rancho and the location of a side track thereon and in further consideration of the sum of one dollar to me in hand paid by the agent of the SPRR; do duly agree to grant and convey to said RR company (the Southern Pacific Railroad) a strip of land one hundred feet wide entirely across my said Rancho to be used for the construction of a line of railroad, and for side track purchased an additional piece of land on each side of said hundred feet strip of land eight hundred feet in length and of an aggregate width including said hundred feet strip to be continuous with the land heretofore conveyed by me to said company; etc. ; and all the water which may be needed for railroad purposes. Thursday, May 23, 1872 – Charles Avy of Monterey county in consideration of benefits and advantages of construction of railroad and $1.00; and benefit of fences; conveys a 100 foot wide strip of land 1173 feet long; 2.69 acres to SPRR Co.